The sky is still above you, yet you are very much a part of its landscape. There seems to be no breeze, but you would not be getting far without it. A golfer stands at the tee, trying to decide the safest spot to land his drive around a sharp dogleg, and you are tempted to yell down "keep it wide or you'll go in the water!" You're able to provide an accurate traffic report but, being so far removed from the world of motorized gridlock, it's more pleasurable to just let your mind drift as easily as your body is doing. Besides, it's more fun to watch a flock of wild turkeys scurry across a hidden pathway, or yell down to a banker while he's cleaning his backyard pool, or maybe even gaze at the skyscrapers of New York City if the visibility is clear enough. In short, you are hanging in mid-air with only a basket beneath your feet, a thousand feet off the ground, unsure of where you're headed and uncaring if you ever come down. Welcome to the world of hot-air ballooning. It's a world I never thought of entering, considering a lifelong fear of heights. But, unless you are to the point of climbing a stepladder and getting dizzy, this unique blend of tranquility mixed with a rush of adrenaline is something to experience, at least once. I was fortunate to do just that when Fred Grotenhouis of Balloonatics and Aeronuts in Phillipsburg was gracious enough to provide a beautiful spring evening ride in early June. Admittedly, the fact that "loonatic" and "nut" were parts of the company title had me a little reticent. But this tale was supposed to be told by one who was apprehensive, and they picked the right man for the job as witnessed by the battle raging within my mind on the ride to Fred's home. "Didn't the Hindenberg blow up?" "That was a blimp, you idiot." "Oh yeah. But didn't the Wizard of Oz's balloon blow all the way over the rainbow?" "That was a movie you dummy." I pressed on, and arrived around 6:15 p.m. greeted by Fred, his partner Giulia Iannitelli, and his sister-in-law, Mary Jean. Fred would pilot, Giulia would be our "chaser" and Mary Jean was along to help us take off, land, and enjoy the ride in between. It should be noted balloon rides are held only at sunrise and sunset during most of the season, because that is when the winds are calmest. It has to do with the thermal activity caused by the sun. We drove to an open field behind Fred's house, and the process was fascinating from the start. Fred sent up a small helium balloon to see which way the wind would take us, then began to fill the balloon, first with cold air in order to inflate it. Giulia held the top of the balloon so it would not rise too quickly, thereby closing the mouth and cutting off the inflation opening. Meanwhile Mary stayed at the mouth in order to help keep it open. Once inflated with the cold air, the raging "whoosh" of hot, flaming air blasts inside as the balloon begins to rise. Just watching it go from a limp piece of plastic to the majestic multi-colored spectacle was impressive. Mary, Fred and I finally hopped in the basket. Giulia hangs on for extra weight, then jumps down and gets in the car to begin the "chase." Since it's never certain which way the wind will take a balloon and you're never sure where it might land, a chaser follows on the ground either by keeping the balloon in sight or using two-way radios. "It's challenging to try and follow when he lands," Giulia said. "I actually have trouble with directions, going east, west, north, but I learn to go on instincts. If I lose sight of him for about 15 minutes than I'll call him on the radio. You really have to know the roads." It struck me that perhaps I should write this story on the tracker and remain safe on the ground. But that thought came a little too late, as another blast of air suddenly had us in the air, our little basket dangling beneath the massive balloon. As the ground began to grow distant, my stomach started to churn. Each new blast of air Fred unloaded made me jump a bit, but it was too late to turn back. "Usually, it's such a calming experience," Fred said. "If somebody's really nervous, we'll stay lower, but in another 10 minutes you'll feel right at home. There's nothing to be concerned about. You don't feel a breeze in a balloon because you're going with the wind. It's strange, because it's not really dangerous. It's probably the safest way to fly." To keep my mind occupied, I began interviewing Fred, who has 33 years of flying experience including military flight training, helicopters, fixed wing and balloons. He got into the ballooning business in 1980 after a sailboating venture in Myrtle Beach was not paying the bills. He actually sold one of his boats to a balloon pilot in return for a ballooning license. As the interview progressed, I found myself becoming less jumpy. I still could not look straight down, and whenever someone moved and the basket shook, I held on a little tighter. But by looking outward at the landscape, it took away that sensation of standing on the top ledge of a 40-story building. It also offered a real-life panoramic painting, complete with everything from golf courses-to-church steeples; cornfields-to-reservoirs and highways-to-hidden trails. It amazed me how utterly peaceful it was, with the only sounds coming from our conversation or another blast of hot air. Every so often it appeared we were ready to hit trees, but Fred would calmly puff some more fire into the belly of the balloon and we'd rise tranquilly above the grasping branches. Fred, who teamed with Mary to successfully calm my nerves, would note various points of interest as we drifted over the Merrill Creek Reservoir and Montana Mountain. We even glided above the house of a banker friend of Fred's and the two exchanged abbreviated banter. Folks on the ground would wave up, and Fred and Mary would wave back vigorously. I was still using two hands to hold on, so my waving was minimal, but a strange metamorphosis had occurred. My fears were pretty much gone, even when we got to 1,000 feet in the air. Although we had a clear night, it was not full visibility. For those lucky enough, Fred says the view stretches from New York City to Philadelphia on high visibility days. He noted that normally the winds can carry a balloon anywhere from a half-mile per hour to 11 miles per hour and that you can fly at levels from 500 to 18,000 feet off the ground. "It never feels any different," Fred said. "I flew up to 18,000 feet one time and we went 70 miles and hour, but because you're going with the breeze, you never feel it. The only difference is that it's two degrees cooler every 1,000 feet you go up." The time had finally come to land, after a flight that went about three miles, and we descended into the town of Stewartsville. Landing sites are often new to the balloon pilot, since the landing can take place in a backyard, a barren field or a school parking lot. "We pretty much just yell down to people, 'Hey, can we borrow your land for a minute?'" Mary says with a laugh. This time, we touch down in an open, though somewhat bumpy, field. We are greeted at the landing site by Giulia and nearby residents Lydia Herleman and her son Buddy. The landing is smooth but we can not leave the basket until Giulia shows up to hold down the balloon. Once the process of deflating and folding the balloon is completed (and as a passenger, even a paying one, your help is in this endeavor is appreciated), we adjourn to Lydia's home for the traditional post-trip snack of champagne and fresh fruit. 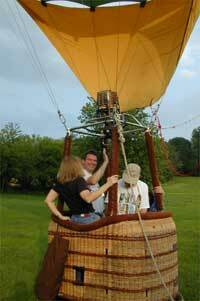 "That goes back to the first days of ballooning over 220 years ago," Fred said. "Since that was the first way men flew, people would see the balloons coming and think they were evil spirits or demons. They'd see something in the air they knew nothing about and sometimes farmers would attack with pitchforks or whatever. So balloonists started carrying champagne to dole out as they landed to pacify the people, and it's a tradition that just stayed." While at the Herleman home, I discovered that Lydia has been following balloons for over 10 years. "Whenever I see a balloon in the air I get in the car and go," she said. "When they land, I'm there to watch it come down." Proving that ballooning is for adventurers of all ages, Lydia finally got her first ride last year, for her 75th birthday, when her husband Martin surprised her. "I always knew I wanted to go up in one," Lydia said. "You're up there, but you don't feel anything. We flew over Phillipsburg, over towers and houses, kids are coming out and waving. It's not like a plane where you're closed in with all the noise. I thought it was better than I ever expected." Hot air ballooning has taken off (no pun intended) in New Jersey the past 20 years, becoming a symbol of romance and excitement. A ride in a balloon can provide breath-taking scenes of New Jersey, New York and Pennsylvania, which in turn provide a unique backdrop to celebrate special occasions such as a wedding anniversary, engagement or birthday. "When I started 20 years ago, there were three to four operations in New Jersey," said Fred Grotenhouis of Balloonatics and Aeronuts in Phillipsburg. "Now there are about three dozen operations and a couple hundred pilots. There wasn't too much competition back then, but it's amazing, all the balloonists still stay busy." If you're planning on a trip, there are certain things to realize no matter whom you fly with. Every flight is either at sunrise or sunset in the summer, but even by making reservations for a flight, there is no guarantee you'll take off that day. The pilot must check with the weather service to find out about the winds or possible rain and lightning. If the forecast is too dangerous, the flight is postponed. Each flight lasts one hour and the cost can run anywhere from $160 to $200 per person, with special rates offered depending on the size of your party. The average balloon basket can fit around four people. A licensed balloon operator must have 10 hours of lessons to get a private rating, and 35 hours for a commercial rating that enables them to take other passengers up. The Federal Aviation Association demands balloons fly at least 500 feet over the nearest obstacle and 1000 feet over towns and cities. Upon landing, passengers might sometimes be asked to help in such matters as folding the balloon, or something of that nature. It helps to wear comfortable clothing. As for motion sickness and fear of heights, neither comes into play as often as you might suspect. "Don't even think about motion sickness in a balloon," says Tom Baldwin of In-Flight Balloon Adventures in Clinton. "There is no motion involved in the balloon except for take-offs and landings, which don't last long." "Over half the people we take up are afraid of heights," says Rob Stasyshyn of Sky Sweeper Balloon Adventures in Clinton. "We just tell them 'Don't look down, look out'. And we'll stay low if they want, just over treetop level." "The first five minutes, everybody's a little nervous," said Rodger Kell of Phillipsburg's Have Balloon, Will Travel. "You have the anticipation, the noise of the burners. But it's very safe; safer than driving your car." When the flight ends, count on a tailgate picnic of champagne and hordourves, which is a longstanding ballooning tradition. Although most Skylands operated businesses own one or two balloons, they can sub-contract in order to take out larger groups. Most provide flights seven days a week, year-round. In Flight Balloon Adventures flies year-round, seven days a week, and offers anywhere from personalized two-passenger service to corporate party flights of over 50 people. They also offer overnight bed and breakfast specials, and there are corporate tethers offered. A tether is when the balloon remains tied to the ground, but the rope has enough slack so the passengers can lift up to 75-to-100 feet to provide the sensation of flight. Call 908-479-4674 or log on.